We are in Barcelona in the late 19th century. The old city walls have just been torn down, finally freeing the city’s growth outward towards the old villages that surround it. Based on the plans by Cerdà, the construction of Barcelona’s famous Eixample (Catalan for “expansion”) has begun. It is a period of great prosperity when the burgeoning upper middle class families found their fortunes and used their wealth to demonstrate their power by constructing unique buildings and supporting initiatives for the city’s inhabitants. However, not everything is so pleasant in the city. Its prosperity is drawing more and more people to work in the big city, and revolutionary movements are taking hold among the city’s unemployed workers. 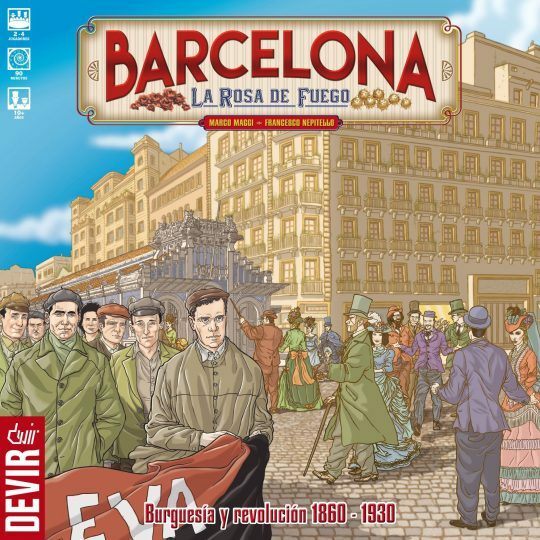 Barcelona: The Rose of Fire is a board game for 2-4 players in which the players compete for social prestige and personal wealth while trying to avoid the revolution that is spreading through the city. In more detail, the players take turns using cards to build their influence by constructing buildings (tiles) in the new city, outside the old medieval walls. The better and more spectacular the construction, the more notoriety they gain. But at the same time, this construction boon brings many workers who are living in much cheaper venues. Building high-class buildings, while rewarding in terms of prestige, may generate unrest amongst the popular classes. In order to avoid strikes and riots, players have to make sure that they construct buildings for the popular classes as well. During the construction phase, players place workers in the Raval zone depending on the sort of buildings they construct. At the end of each era, all those workers are placed into a bag, alongside peacekeeping soldiers. Depending on the level of unrest, a number of these figures are drawn from the bag and the player with more figures drawn from their color suffers a strike.